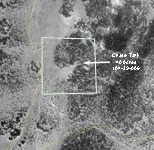 Chase Tank Forest Inholding - Apache County, Arizona, Headquarters West Ltd. The property is located in eastern Arizona near the New Mexico state line in southern Apache County approximately 200 miles northeast of Phoenix, Arizona and 170 miles southwest of Albuquerque, New Mexico. 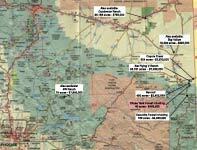 The property is 9 miles south of US Hwy 60 within the Apache-Sitgreaves National Forest, 11 miles east of Springerville, in the White Mountains of Arizona. The property is accessible by 8 miles of paved US Hwy 60 east from Springerville, Arizona to County road #4225 (maintained gravel), then 3½ miles southeast on #4225 to a dirt road, then 5½ miles southwest to the boundary. The land is contained in a square block surrounded by National Forest on all sides. This forest in-holding property is located in a small valley surrounded by two malpais mesas in the area known as Loco Knolls. There are no building improvements located on the property. Topography includes small rolling hills with scattered Pinion Pine and Juniper trees. There is one developed well on the property approximately 700 feet deep producing 10 gallons per minute.